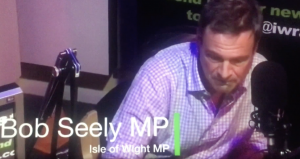 IOW MP – Bob Seely has associations with both Wightlink and Red Funnel ferry companies. The MP’s cousin – Patrick Seely is a non executive Director of Red Funnel and Bob’s good friend and election campaign manager David Pugh, has Wightlink as a major client in his lobbying company ‘Chine Consultancy’. It is evident that he has been desperately active to shut the Fixed Link Campaign down since he became MP. The MP certainly manipulated fellow director of ‘Able Connections’ – Tim Cooper, away from assisting with fixed link progress… by offering him government and local council work instead. The MP then set about causing rifts between Tim Cooper and Carl Feeney… apparently to dismantle the campaign in its entirety. 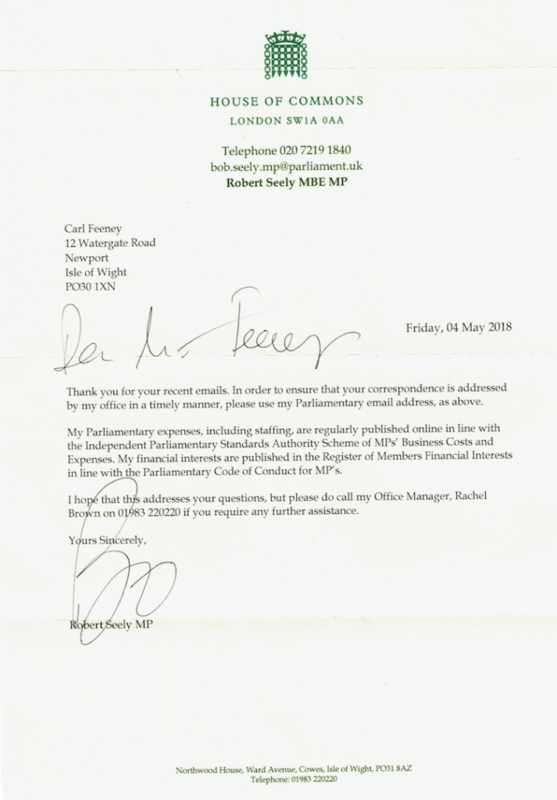 The MP then attempted to discredit Carl Feeney in front of IOW business leaders. These and other attempts by the MP to protect the powerful and influential ferry companies from future competition in the form of a fixed link, have so far failed. The new IOW MP appears to have no qualms with manufacturing false information, in order discredit those who oppose his ideas and plans or risk his continued tenure as MP. Able Connections Ltd (AC) was set up to use as a legitimate medium with which to communicate with mainland authorities about the Fixed Link. As Tim was naive to the campaign history, Carl suggested that Tim just operates through AC and not PRO-LINK in order to protect himself from the potential contentiousness that the Campaign group sometimes attracts. From that point, Tim Cooper did not make any comments on the Facebook group and concentrated with Carl on the progression of talks within authority contacts that Carl introduced him to. Carl also campaigned outside of AC, within the PRO-LINK envelope. Tim was at the time unemployed. He needed contacts on the island to gain work and Carl had those contacts through managing the campaign already for two years. Under company terms of reference, it was agreed that Tims payback for helping with the campaign, was to secure contacts for potential personal work. This was as long as that work did not compromise the overall goal of achieving fixed link studies and finally a fixed link. A good working relationship developed over the following months, including meetings and introductions with infrastructure specialists in London, meetings and introductions with IOW and mainland Councillors, Chamber of Commerce, IOW Regeneration Team, the former MP Andrew Turner and advisors and so on. Within a few months, Tim Cooper had gained vast contacts and the campaign had raised his profile from a complete unknown, to fairly well known. Carl Feeney had kept his side of the bargain and Tim had done some great work alongside Carl. During December 2017, Carl and Tim met with the MP – Bob Seely in Westminster. (Documented here. )It was around two months after that meeting that relations between Tim and Carl became strained. Irrational behaviour by Tim caused Carl to believe that Bob Seely had been in communication with Tim. This was to be proven correct. Tim declared that he had been offered work by Bob Seely. Carl warned Tim that the MP would use his influence to be divisive. (See WhatsApp thread below). Not long after, Tim stated that he was unable to communicate the conversations between himself and the MP to fellow directors – Carl and Kevin due to “client confidentiality”. Because of this situation, the relationship became increasingly strained as Carl and other fellow director – Kevin Price, lost trust in Tim’s integrity and motives. It became apparent that the Bob Seely manipulated Tim, to the extent that Tim willingly put the company of ‘Able Connections’ in great jeopardy. This below is the Facebook Evidence proving that Bob Seely, at an IOW Chamber of Commerce ‘Ask the MP’ meeting, denied he’d ever offered Tim Cooper personal work… calling PRO-LINK chair – Carl Feeney a “liar”. This below, is the post that Carl Feeney put up on the IOW Fixed Link Tunnel Campaign Facebook Group on the 11th May 2018. These are the comments on the Fixed Link Campaign Facebook group by Andrew Nordbruch, describing the slanderous statements from Bob Seely, after Carl Feeney had left the ‘MP questions’ meeting early with chamber member – Jon Benton. 2/ Chamber of Commerce Transcript of Bob Seely’s claims. BS: : Okay thank you for your question Carl. Can I just ask you, have you been recording part or all of this meeting today? BS: Okay so you haven’t been recording it. But you have been tweeting. CF: No I haven’t been tweeting. CF: Could you show me the tweets? BS: No but you’ve just been very busy on your phone. CF: You’ve just accused me of tweeting. Can you show me the tweets? BS: Now I’m asking you a question. CF: And I haven’t been tweeting. BS: Thank you. End of questions. Alright, thank you very much. Thank you for being here – I think. You talk about me getting public subsidies to lower the fares. That is not true. I haven’t tried to do that. What I’m trying to do is get the ferry companies to be better supporters of the Isle of Wight. You said that I was placing obstacles in the way of a feasibility study. I’m not and I’ve never done so. BS: Well, whatever you call it a viability study, a feasibility study. CF: They are two different things. BS: I haven’t put any obstacles in the way. What’s your evidence? BS: Okay apart from saying “you have”, what’s your evidence? CF: Okay. We have Tim Cooper who is a director of Able Connections which is a company set up in order to communicate with mainland authorities and we came to see you in Westminster. We had a meeting there. You have now offered him work. BS: : Let me – let me answer your question. I don’t know what said to you. If I pay people for anything I have to put it in my register of members ’ interests. CF: It’s pro bono work. BS: : Okay that is just a false statement and it’s completely untrue. I have not offered any work whatsoever. A constituent is welcome to come and see me and I’m giving opinions. BS: : Don’t worry – I’ve replied once, you’ve emailed me again, there’s another reply coming. TS : Can we go back to the question? BS: What Tim has said to you is his business and yours. I’m sorry that your relationship with him has broken down as it seems to. He has found you an extraordinarily difficult person for you to work with… he found you an extraordinarily difficult person to work with and told you that. That is your problem, that is his problem, that is not my problem. The idea that I’m spending money to break up your brilliant idea and brilliant scheme is nonsense . It is a lie. And can I just say when it comes to fixed links the person who is damaging the fixed link campaign more than anyone else on the Isle of Wight is you, by your antics and your behaviour, and instead of making a coherent case you’ve used your f ixed link page as a vehicle for abusing me and anyone else who disagrees with you. It may be that we will get a fixed link in the next 10 to 20 years. In the meantime what I have to do as the public representative of this island is argue for the best deal that I can get for the Isle of Wight and that is what I will do. BS: : If somebody wants to offer three billion pounds for a fixed link let’s have that debate. There is not a chance that we will get that privately or publicly beca use even your partner or former business partner admits that at the moment the borrowing costs on two to three billion pounds a year will be upwards of £ 90 million and there’s no way of the Island affording that privately and the money is not on offer from the national government so a fixed link is not feasible under the current system. However – I’m very happy for you to argue for a feasibility study and if instead you had tried to work with me rather than try to use your site as a vehicle of abuse I would have been more than happy to talk to Chris Grayling and I’ve actually done so anyway about this and I will be writing to him over the summer looking at if there is any chance for a feasibility study, but instead of working with me on this you have attempted to be abusive and unpleasant and frankly obnoxious instead and the only person you’re shooting in the foot is yourself. So what you’ve said – the accusations that you’ve made are untrue and false. If you wish to keep peddling them I feel sorry for you. Do we continue with this conversation or not? T S takes question from an audience member which Bob answers for several minutes. BS: Do you want to ask your question yourself – you are very welcome to. BS: Fantastic. I did have a go – Wightlink did have a go at me the other day. was very unpleasant yesterday because I was moaning at them for their breakdown on Bank Holiday Monday. I feel everyone’s pain about this one as well. JB: I’ll write to you about it. BS: Please do. Thank you. JB and Carl Feeney left the meeting . Question is asked about the marine sector for two minutes. BS: Yeah he invites himself. It’s just really unnecessary because it’s antagonistic, aggressive and his business partner basically said “ I can’t work with you because you’re poisonous ” and he’s now blaming me because he thinks I’m paying in secret. There’s… came to see me at a meeting and he’ s a constituent and said “ I’ve got some ideas ” . Whether he said it ’s … I don’t know . I mean if you come to see me and say … you just offered me pro bono advice on education – have you? I thought we were just having a conversation , you know what I mean. 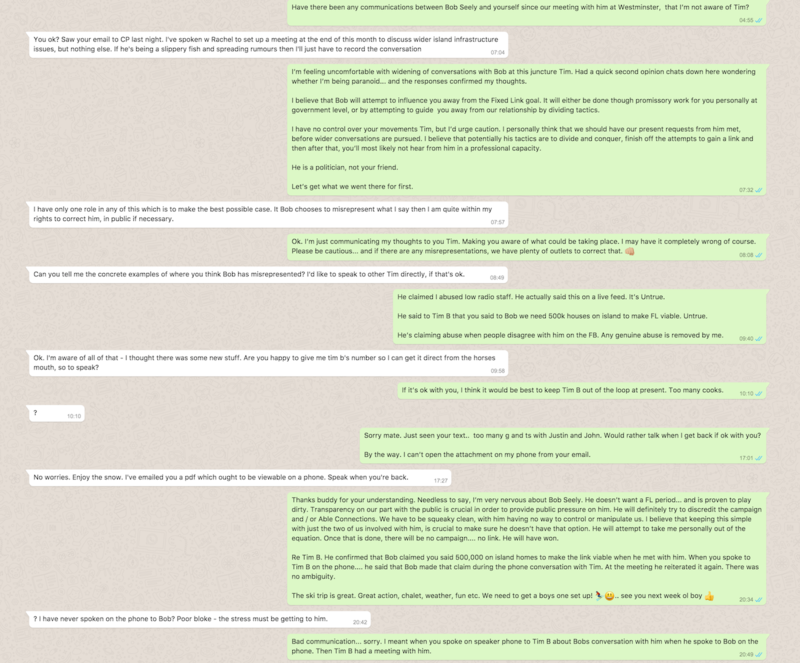 So he’s accusing me for the breakup of his business relationship because his partner can’t work with him . BS: … but I’m also being beasted by some rich businessmen as well in London so… I’m a little bit stressed at the moment.
? I think if you can convert that towards the Regional Schools Commission I think that…. Carl Feeney was constructing his question, which was read from his phone. He was not tweeting or recording as the MP had accused, while attempting to guide the audience into believing. Bob Seely claimed Carl Feeney “is damaging the Fixed Link Campaign more than anyone else” to the Chamber members. Carl Feeney feels very reassured that such a staunch ‘anti linker’ as the MP, is suggesting that Carl gives up. The PRO-LINK chair thanks the MP for such a compliment of his continuation of the campaign work. The MP claims abuse. In point of fact, if there is anything considered abuse on the Fixed Link Campaign Facebook Group, it is removed immediately when seen. Perpetrators are removed from the group. There has always been a strict policy against abuse. To leave anything abusive on the group would be discrediting and detrimental to the Campaign in any case. Disagreeing with the MP’s beliefs or opinions, is not being abusive. The group does discuss the MPs views against a fixed link. It’s a debating group. PRO-LINK asks the MP for the evidence of police intervention or any necessity for police intervention? PRO-LINK is unaware that this has ever occurred and believes this is pure exaggeration by the MP, designed to create disgust after the awful MP – Jo Cox murder. PRO-LINK chair – Carl Feeney has sustained constant abuse and threats on a ‘closed’ Facebook Group called ‘No Fixed Link Forum’ for over 3 years. The police have never been called as it is considered a sacrifice one makes when putting the ‘head above the parapet’. However, while a ‘career MP’ is paid to handle public exposure, campaigner Carl Feeney gives his campaigning time, energy and sacrifices for no charge… in a totally uncorrupted fashion, for the potential future benefit of the Isle of Wight. Carl Feeney was invited by chamber member Jon Benton, as a replacement on the same day as the meeting. He did not “invite himself”. The MP – Bob Seely seemed to know an astonishingly large amount about Tim Coopers working relationship with Carl Feeney, considering he claims there is no intimate line of communication between them. To have extracted that information from Tim, it would appear that the MP and Tim Cooper would have nutured a close relationship. By informing the audience of any potential strain between Able Connection directors, including quotes such as “i can’t work with you because you’re poisonous”, the MP further attempted to put another nail in the fixed link campaign coffin and discredit Able Connections, while driving an even larger wedge between the Tim and Carl’s working relationship. This was done without Carl Feeney present to defend himself. Once the indisputable evidence below has been digested, Carl Feeney expects a written apology from the Chamber of Commerce in consideration of the disrespect shown to him during the meeting, especially when he left the premises. Carl at all times behaved politely, even when he was aggressively accused of recording the meeting, tweeting and lying by the MP. To understand the contentious history between the MP and PRO-LINK before the MP decided to offer ‘Able Connections Ltd’ – Tim Cooper work…. click here. 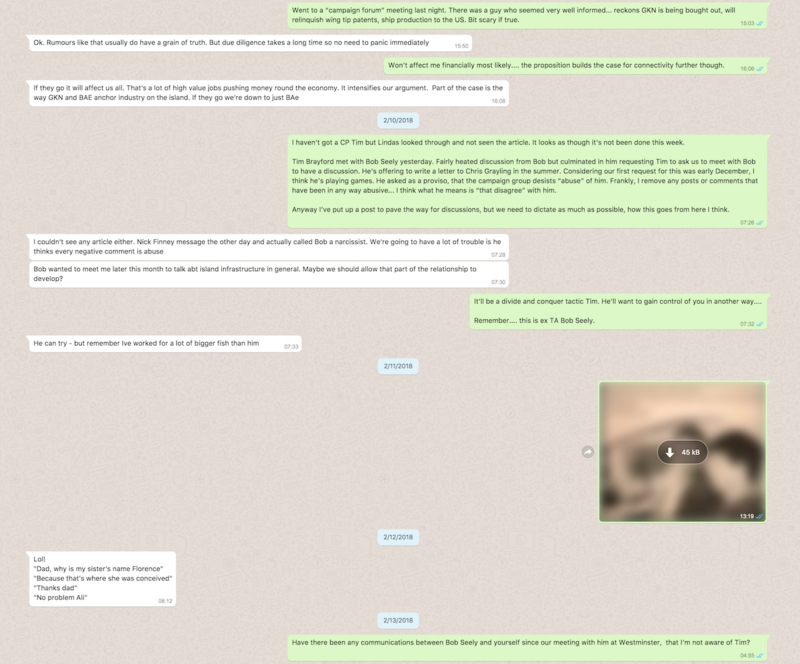 The ‘WhatsApp’ initial evidence indicating that Bob Seely did offer Tim Cooper personal work. PRO-LINK requested a statement from the MP to confirm in writing, his position on the matter. 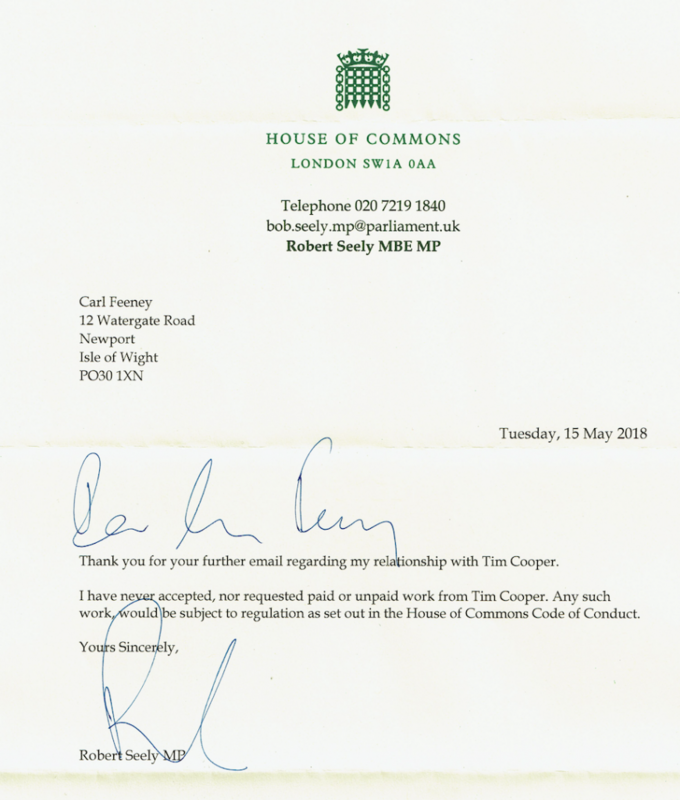 On the 17th April, Carl Feeney requested Bob Seely to state whether he has offered work to Tim Cooper, also asking whether the MP is now a ‘client’ of Tims. When more than 14 days had elapsed, Carl once again asked for a response? Below are the email communications from Tim Cooper that refute the MP’s claims that he “never accepted, nor requested paid or unpaid work from Tim Cooper”. The MP appears to have severely contrevened “Commons Code of Conduct” regulations, while at the same time blatantly lying to the IOW Chamber of Commerce and willfully slandering a member of his constituency. Below are portions of the email correspondence between Tim Cooper and PRO-LINK chair Carl Feeney. The working relationship between Tim Cooper and other company directors Carl Feeney and Kevin Price, became strained and more unworkable as the MP became more involved with Tim. Subsequently, Able Connections was put in great jeopardy by Company Secretary – Tim Cooper. I believe your pursuance of private work from Bob Seely, will give opportunities to him to discredit and obstruct the campaign… perhaps even using a divisive tactic to cause problems between you and AC. Perhaps this is already occurring? The last email we had from Bob Seely, he requested we should contact him at the end of January. A few weeks ago I mentioned this to you and you explained you’d already arranged a personal meeting between the two of you to discuss “other island infrastructure”. Does this mean that the Link is off agenda?… or are you both having discussions without me being copied in? Considering the lengths I went to in order to secure Bob originally offering a meeting with us, I’d find this disrespectful. Resolution: Full transparency of the communications between yourself and Bob Seely. Copied in communications are necessary. Retrospectively up to date also. Of those concerns, the main one is the developing relationship between yourself and Bob Seely. It now appears he has taken up your offer extended in our meeting and is now a “client” of yours, as described in your email. Client confidentiality is of course something that must be adhered to in a professional environment. This now raises issues of ‘conflict of interest’. Could you please explain how it is possible for you to be a director of a company with the sole aim of implementing an IOW Fixed Link, while also being employed by an MP who has already fabricated discrediting misinformation about our Westminster meeting … knowing his main aim is to dismantle the Fixed Link campaign? I took some notes during our Westminster meeting with him. He is very much against a Fixed Link as you know. His comments “I’m moderately hostile” and “I’m trying to make your idea redundant”, gives the impression that he will use you to further his ambitions to resist the link. I believe that once you are immersed within his personal programme of “other Infrastructure” goals, it will be difficult for you to preserve any employment… while at the same time pushing for the Link that Bob resists tooth and nail. I believe his strategy is to be in a position to control you. Personally, I think your involvement with Bob, will end badly for you, or for the Link. I believe you will be made to make that choice. I expect you’ll believe I’m wrong on all of this Tim, but rather than rejecting these concerns again, could you please give your reasonings this time? Thank you. Bob asked us by email, to contact him at the end of January regarding the Fixed link. We are now midway through March. You confirmed that you contacted Bob during January. I have not been copied into any correspondence. Could you please send me the correspondence emails between you and Bob (Able Connections ones) that concern the Fixed Link? I have absolutely no idea what’s going on. Obviously, you will have separated the Fixed Link Able Connections emails away from your ‘personal business’ emails with Bob. I just need the former. “2. Bob Seely has not paid me to carry out any work for him. I met him last month at Portcullis House to discuss the strategic planning for the Isle of Wight and there was a very brief exchange of emails after. It was explicit from the start that our conversation would not touch on the fixed link. He and the IW Council are working together to develop a plan for the Island and I have had discussions with both parties about their proposed plans. I have done this pro bono in my capacity as a resident of the Isle of Wight. During the course of those discussions I have been made party to confidential information, none of which relates to the fixed link. It would be a breach of trust for me to share that with you. I have been back through the correspondence (which is very short – Bob’s focus is on the Russian attack). 6/ Subsequently, Tim Cooper attempted to place Able Connections in jeopardy. 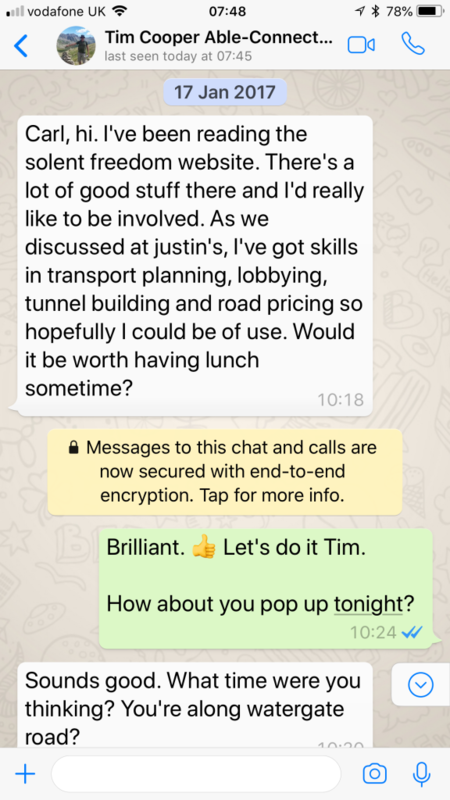 It was after the above email communications describing Tim Coopers working relationship with the MP, that Tim’s irrational behaviour began… and Able Connections Ltd was put in jeopardy. Subject: Fwd: Company confirmation etc. I have received through my door, this communication below from Companies House. I would like to confirm that the company is indeed required. 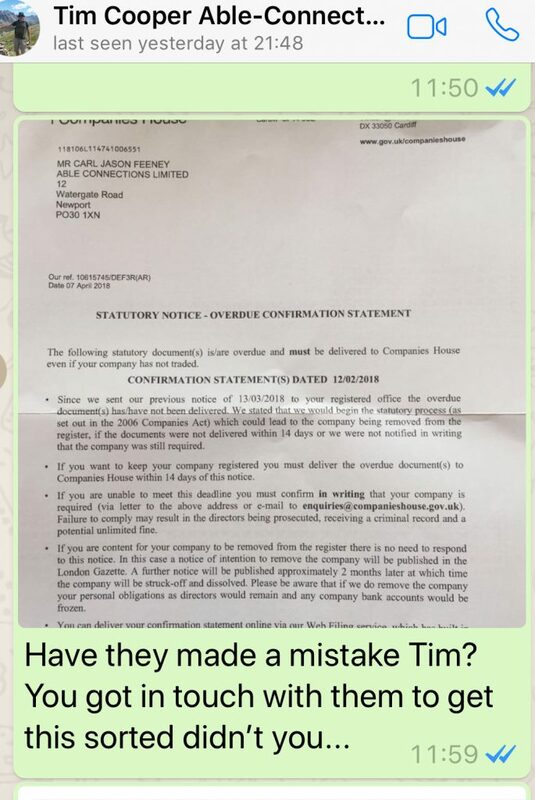 At present, the company secretary Tim Cooper whose dwelling is the registered company address appears not willing to communicate with his two fellow directors – Kevin Price and myself Carl Feeney. We both have no idea whether he has performed the required paperwork or not. Kevin and I are hoping that Tim has now received the ‘authorisation code’ and has confirmed the company. If this has not been done, please email all of us on the above details, to explain our position and potential remedy? I have included below, the last communication with Tim Cooper on 14th April. To date, both Kevin and I have had no response from him, though we do know he is able to. I contacted you by email and WhatsApp two days ago and again as a reminder yesterday regarding the overdue ‘company confirmation’ that Companies House now requires. It is apparent that you’ve viewed the WhatsApp communication but you’ve not responded. Kevin has also contacted you, with no response also. The letter below is dated 07th April. It states that a notice was sent to your address (registered office) on 13/03/18 stating that a statutory process would begin as the ‘confirmation notice’ had not been received by Able Connections Ltd.
From previous communication, you stated you were dealing with this. Obviously, where you’ve not communicated anything as yet to confirm this matter has been dealt with appropriately, both Kevin and I are very concerned. Could you please confirm this matter is being processed by you according to the Companies House letter dated 07th April…. whether by confirming the Company, or choosing to remove the company… which is something that can not be done without all three being involved? We need to know what’s happening please. While I’m writing this email, would it also be possible to clarify your relationship with the MP Bob Seely please? In a previous email to me, you described that you have been offered infrastructure work by him, with a caveat that you must not speak of the IOW Fixed Link project or studies. It has become clear that the MP is attempting to dismantle the campaign and also Able Connections Ltd. You have stated also that you are now unable to copy either myself or Kevin in any of the email communications you are having with the MP due to “client confidentiality”. This includes any conversational communication. Kevin and I are fellow directors of yours in Able Connections Ltd, a company set up specifically aiming to achieve studies to gain information and to ultimately construct an IOW Fixed Link. Through this company and my introductions to contacts, you have picked up work for yourself personally. Could you please explain how your work with the MP does not create a ‘conflict of interest?’ There have been no communications from you regarding the MP since he said “get in touch at the end of January”, in his last email viewed by us. For absolute transparency, it would be appreciated if you could clarify your positions on the above points. Thank you for your email of 18/04/2018 concerning the confirmation statement for 12/02/2018. As the company is required to remain on the register, the proposed strike off action has been discontinued. The failure to file a confirmation statement is a criminal offence but I will defer any prosecution action for 14 days from the date of this email. If the company record is not brought up-to-date by that time, the directors may face criminal proceedings. Conviction for this offence will result in a criminal record and a potential unlimited fine for each document not delivered on time. It quickly became clear that the MP – Bob Seely’s ‘better’ offers of work to Tim Cooper, influenced him to attempt to dismantle the Pro-Link Campaign and Able Connections… intentionally jeopardising the company. Fortunately, it was saved. 2/ Once Companies House had become involved, Tim Cooper replied. I note your recent emails to me and to Companies House, and the email correspondence between myself and Carl last month. It is my regretful decision to inform you both that I no longer feel able to continue as secretary and director of Able Connections. There are a number of reasons for this, and I will set out below the two main ones. I will also describe my understanding of the implications on our respective activities in the future. When we established the company it was to create a deliberate distance between ProLink and my own activities. At the time I felt that two aligned organisations, one acting as a lobby group and one acting professionally, would be a very effective way of levering political support. I still believe that this is the case. What I had not appreciated is how completely that leverage would be neutered by having a member of the lobby group within the company. Whatever might be said about Bob Seely’s behaviour, the meeting with him at Portcullis House bordered on disaster. I cannot allow a similar meeting to take place. It damaged the chances of the tunnel being built and my professional reputation. There are serious and pragmatic conversations which need to happen with political players about how to make the link happen and, on the whole, I do not see how they happen with a lobby group in the room. If the only reason was the one described above, it might be possible to imagine a world where Able Connections continued but with no active involvement by members of ProLink. However directors of a company need to trust one another. I set out in my emails to Carl the reasons why I have no trust in him – primarily the reports in the County Press regarding the Medina crossing, and the behaviours around the meeting with the Chamber of Commerce and its subsequent reporting. Since then I have suggested how we could re-establish trust through a regular meeting. This meeting has not taken place. Without trust we cannot work together, and, without a willingness to agree fault on both sides and find a way to work together, we can never establish trust. It is therefore with a heavy heart that I have to start the conversation about how we dissolve our partnership. The agreement which we signed commits us all to certain obligations. The most problematic of these is the commitment not to proceed with activities to build a fixed link via any other vehicle than Able Connections. This obligation of course applies to us all equally, and could be used to close down ProLink or any other organisation you might chose to set up. I see no benefit in trying to do that. We have a shared aim, and ProLink’s lobbying plays a valuable role in achieving that aim, as do my activities. My suggestion is that we simply agree that we will absolve each other of any obligation under that clause, leaving each of us free to pursue this opportunity by whatever means we choose. If we do this, it would then make sense to allow Able Connections as a company to lapse and for each of us to leave with what we brought to it. It has never traded and I do not believe that there will be any negative outcome from this. I will close this email by repeating an earlier sentiment. I believe that a combination of a vocal and active lobby group and a professional body is powerful. There does not need to be any formal relationship between them, but I hope that as and when the need arises we will be able to work together to achieve our shared aim. 3/ Carl Feeney’s reply to Tim Cooper. Subject: Re: Company confirmation etc. Thank you for your email below Tim. The form to resign from the company of Able Connections Ltd is TM01. If your intention is to exit the company, I’d suggest this course of action? Your comments below have been noted. Both Kevin and I are also aware that under the combined signed ‘terms of reference’, we have obligations not to continue the goal implementation of an IOW Fixed Link outside of the Able Connections Ltd Company envelope. There may be a way that you can continue on your own outside of Able Connections Ltd, as your clear intention now, is to exit. Kevin and I will contact you further with regard to this, in due course. 4/ Tim Cooper’s reply to Carl Feeney. Thank you for replying. Clearly there are things which we need to discuss before any formal resignation. Can you expand on your penultimate sentence? If we simply allow the company to lapse then no forms are needed and we each take our IPR with us. This seems to be the simplest approach. Do you have an alternative proposal? 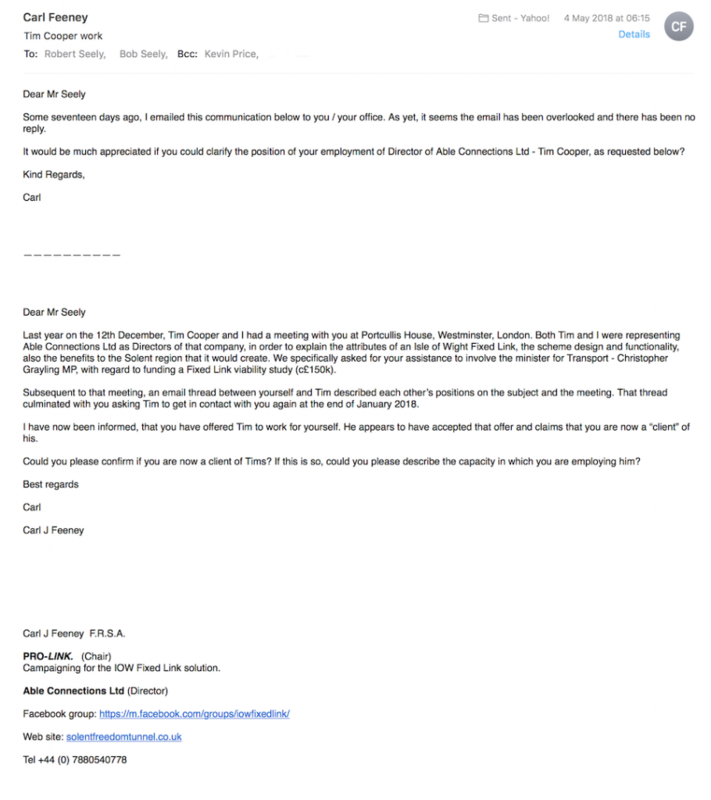 5/ Carl Feeney’s reply to Tim Cooper. It’s proving difficult to establish a solution our end, as we don’t quite understand your own proposal Tim. Could you clarify in more detail exactly how you would prefer to proceed, including an explanation of your intentions in the future? All three of us intend to continue working to create a fixed link to the island. We have been unable to work together – the last thing we attempted to collaborate on was the Chamber of Commerce meeting which was not a success. Individually, however, we have had some success in our relative fields. If we separate it should be done in a way which allows each of us to continue working with minimum hindrance, in the hope that, if we are able to focus on our strengths, we will be successful in achieving our shared aim of creating a fixed link. My proposal therefore is that none of us has any future claim on or obligation to the others, and that no constraint is placed on any of us regarding future contact or relationships with potential stakeholders and backers. This is based on the understanding that we have all fully disclosed the current status of our discussions with stakeholders and potential backers. If we do this there are a few administrative issues to deal with. The first is that we should agree that none of us will trade or act under the Able Connections name for a period of time (I would prefer perpetuity, but we could talk about a time limit if that’s preferable to you). I suggest we keep the website and email addresses alive for a few months, after which we can have a period of time where it sends an autoreply to people giving them our personal emails, and then some time after that we close the site down. So long as all contact via the website results in an email to all three of us, I don’t believe this disadvantages any of us. There are some funds in the Able Connections bank account which would need to be returned to you and then the account needs to be closed. Essentially I want a clean break, no fault “divorce” with no future ties between us. There will be times in the future when we may need to act together, but I would prefer that we deal with those as they arise. Trying to agree now how we will behave in some unspecified future scenario is likely to cause more problems than it solves. 7/ Carl Feeney’s reply to Tim Cooper. Thank you for that suggestion Tim. We will need some time to consider it. In the meantime… and before it is possible to convey our response to you, there are two main questions that we need you to answer please and one other that has been asked a few times, but not yet answered. There appears to have been some failure on your part to administer your obligations as company secretary. 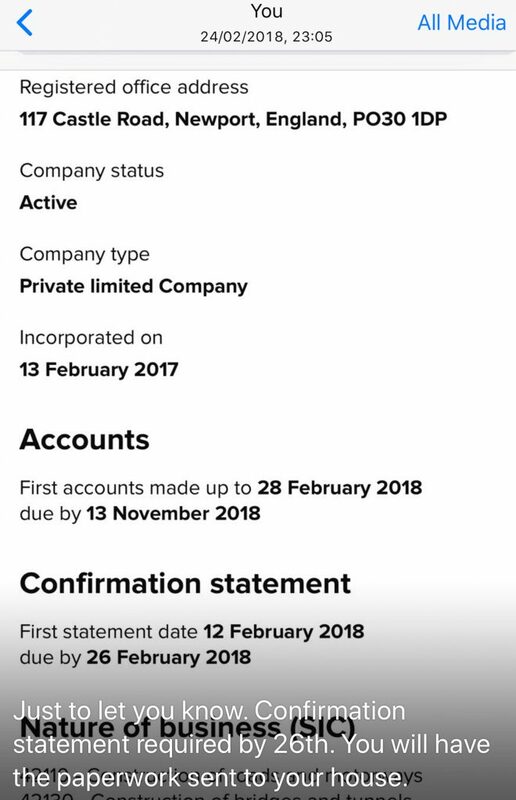 On the 24th Feb I checked the company details for Able Connections and noticed the ‘Confirmation statement’ had not been processed. As your home is the registered address, you will have received the authentication code to carry out the statement. Below is the WhatsApp message I sent you. On the 7th March you replied. It appeared (from the conversation below) that you hadn’t applied for the code until my warning on the 24th Feb, two days before the confirmation was due (26th). However, Companies House have informed me that the code was requested online on the 26th, so you would have received it. 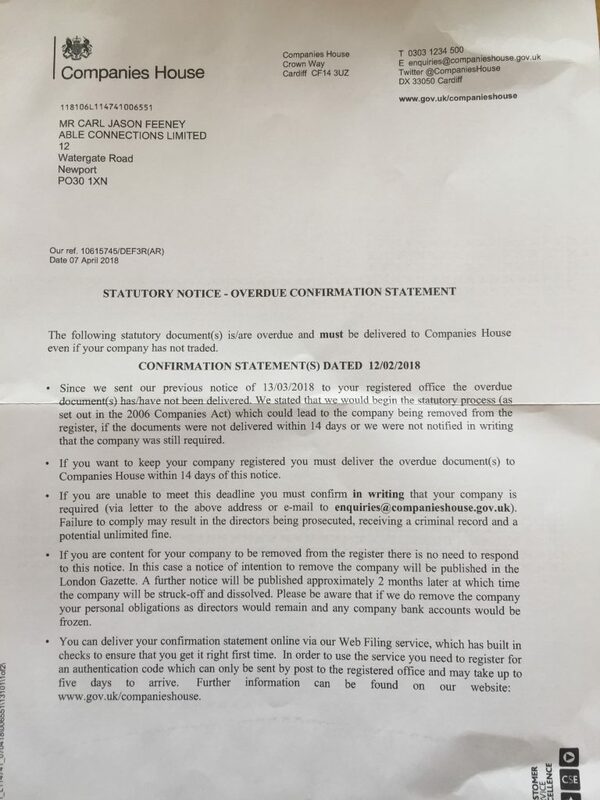 On the 12th April I received the letter (below) at my own home address from Companies House. 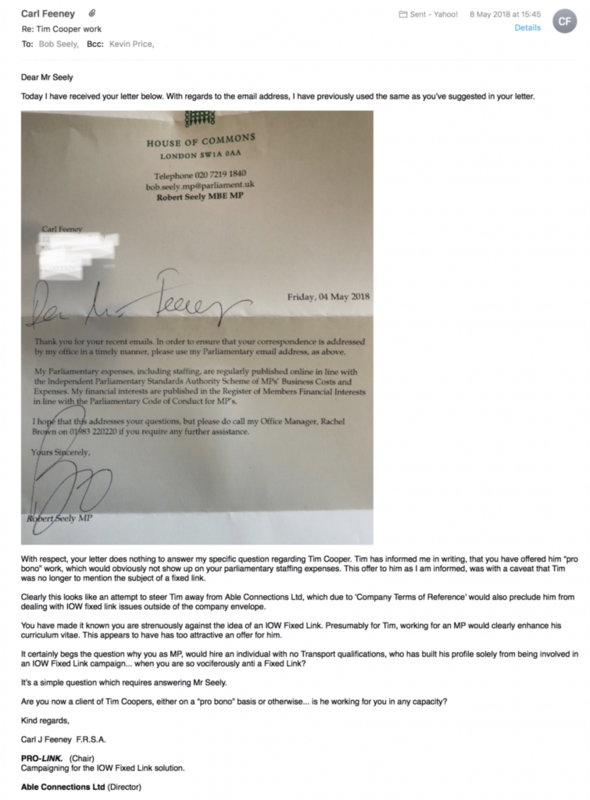 The letter states that the company confirmation was still due and that 14 days after the date of 7th April, the company risks being struck off. At this stage both myself and Kevin attempted unsuccessfully to contact you several times with different methods, in order to find out what you were doing about the situation, in your position as Company secretary. In the mean time while all this was going on, polite communication continued between the two of us regarding funding strategies, general banter, etc. Accordingly, it is now quite unexpected that you have put the company so convincingly in jeopardy with such apparent premeditation. It appears now, that the cordial communication was designed to keep me from suspecting anything untoward. Both Kevin and I had been trying to contact you for several days with no luck. 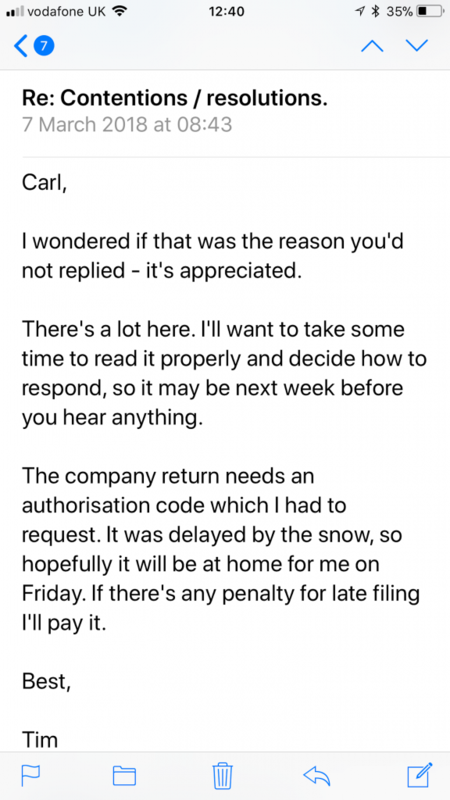 Once I had copied you in on the email I sent to Companies House, you managed to construct a fairly lengthy response and contact us both in less than four hours. It appears that you had all through the process, been playing delaying tactics to have the company struck off and then not be bound by the ‘terms of reference’. Could you please explain your motivation for your actions as described with the evidence above? This weeks County Press (20th April) had an article concerning yourself performing a lecture / presentation to ICE. You penned the article word for word, sending it to Alan Marriot for publication. This was not a report by the County Press, although it looked liked one. No information was checked by the editorial staff. I was not consulted by them either. 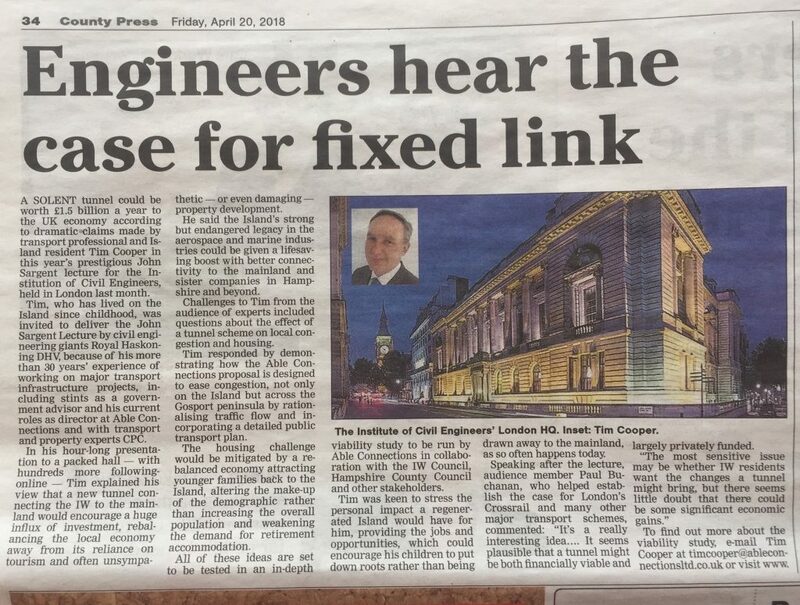 “Tim was invited to deliver the John Sargent lecture by civil engineering giants Royal HaskoningDHV, because of his more than 30 years experience of working on major transport infrastructure projects”…. and so on. Below is the email invitation from Katherine Harris to me, to perform the lecture. I then passed it to you as you would already be in London. Nicola Clay from RHDHV has passed me your contact details. I hope you don’t mind me getting in touch – Nicki and I sit on a UK dredging committee and we’re looking for a speaker for an evening lecture at the Institute of Civil Engineers in London on Tuesday 6thMarch at 18.30. It’s organised by the UK branch of the Central Dredging Association(https://dredging.org/ceda/ceda), an independent forum for the professional dredging community. CEDA UK arranges technical seminars and site visits that tend to have a dredging focus; however, once a year we hold the single-speaker ‘John Sargent lecture’ on a broader topic of interest to the wider maritime industry. Previous topics have included the Suez Canal Project, the Thames Estuary Airport, and the Floating Houses of Parliament. The lecture is well attended across maritime/marine industries and tends to include representatives from all the major dredging companies, port and harbour authorities, shipping, regulatory bodies such as the Marine Management Organisation, Crown Estate and Environment Agency, and of course a broad range of consultants. It’s followed by a drinks reception sponsored by CEDA’s corporate members. Would you be interested in giving the lecture on the proposed Isle of Wight Fixed Link? I’m sure there are many elements of the project that would be of great interest, but given the audience, a slant towards the engineering aspects would be of particular relevance. If this is of interest I can confirm the finer details. Feel free to give me a call if you’d like to discuss. I’ve run this by fellow director Tim Cooper and it looks as though we could make the 6th in principle. As Tim is based in London during his working week, could I hand over to him for you to make the arrangements please? I’ve copied him into this email. Could you please explain your justification for having such fraudulent misrepresentations published, while assuring editor Alan Marriot, that the information is true and correct? The MP – Bob Seely has established a relationship with you, subsequent to our meeting at Portcullis House in December 2017. You have stated that you have been offered Pro Bono work from him on a personal capacity but under the conditions that a Fixed Link is off agenda. Why would he do that? It has been established that the MP has motivations to obstruct any studies of a link and used the words “hostile to the idea” in our meeting. Some weeks after that meeting with Bob Seely and having had email communications, you are unable to copy Kevin and I in … due to “client confidentiality” as you put it. At the same time, you have become increasingly irrationally hostile towards Kevin, myself and Able Connections. I’ve never operated this campaign to make money as you know. However, you made it clear at the start, financial gain was your motivation and that was fine by me as long as it didn’t compromise the campaign. This below is your first communication with me. At the time you were unknown and unemployed… with a maths degree but no island authority / transport contacts to call upon for work. You came to me for help with the contacts for personal work and offered me assistance at the same time with the campaign. I chose to roll with that. I have promoted you as a transport professional Tim, but as I found out, you have no qualifications in transport, just experience crunching numbers within transport related companies. You are now using my promotion of you and the influential contacts I have introduced you to, for your own personal work, which now unfortunately appears to be at the expense of genuinely continuing with the progression of the Fixed link agenda. Bob Seely is a virulent opponent of a Fixed Link. I believe he is already doing so and certainly will in the future, use his influence on you to condemn and dismantle the fixed link goal. How can you reassure your fellow directors at Able Connections… Kevin and I, that the assessment above is not correct? 8/ Tim Cooper’s reply to Carl Feeney. Reading through your lengthy first question, it seems that the core issue you have is that you believe I engaged in deliberate delaying tactics to avoid being bound by the terms of reference we signed. This is not the case. I believe that the terms of reference we signed have weight independent of the status of Able Connections Ltd, so from my understanding of the situation, allowing AC Ltd to lapse does nothing to reduce any obligations we have to each other. My primary aim in dissolving our partnership is to create a situation where we are each able to work most effectively to achieve our shared goal of a fixed link to the Island. I believe that is best achieved through the method proposed, but I am very happy to hear any counter offer you wish to make. With regards to your second question, nothing in the article is false or fraudulent. It impossible for any short article to explain every relationship which exists between people, so whilst I understand your frustration that ProLink did not receive a mention, there is no attempt at misrepresentation. Anyone wishing you build up a picture of the players involved would be able to do so through various press reports, as is the case for any matter in the public eye. I contrast this to your article in the IWCP last November which deliberately misrepresented my views regarding a Medina crossing. As to your last question, which you say you’ve asked a number of times and I’ve avoided answering, I’m really not sure what you’re asking. You present a series of insults and then ask me for my assessment of those insults. As with much of our correspondence of late, my answer is that I simply won’t engage. I have no desire to enter a slanging match with anyone, and I am disappointed that you have chosen to become abusive. You seem to believe that I have formed an alliance with Bob Seely. This is not the case. Whilst I am happy to listen to your concerns that he will use a relationship with me to frustrate work in support of a fixed link, I am under no obligation to agree with you, and you have no right to start abusing me as a result. I strongly urge you to avoid further insults and to focus on how we can separate in a way which allows us to work most effectively towards our shared aim. 9/ Carl Feeney’s reply to Tim Cooper. You are indeed correct that the signed ‘terms’ have legal pertinence even if there is no Able Connections Ltd. However, to have the company lapse deliberately, did appear to be your aim in consideration of the facts and evidence. It is clear you did nothing to prevent it. With regard to the CP article – you say that “nothing in the article is false”, when clearly it is. Most of the article is an indulgence in fiction, which can be proven. We believe the answer to question number two, sets a wholly discrediting precedent. An honest answer would have been appreciated. Regarding number three, I believe my assessment is accurate. If you believe any of it to be wrong Tim and you feel insulted, please accept my genuine apologies. Please let me understand which facts are not correct? Kevin and I need to spend some time digesting your response Tim. There needs to be a resolution… one that takes your answers above into consideration, hopefully allowing us to diffuse this situation so we can continue forwards. We’ll get back to you soon with the proposal. In the mean time, please copy me into any communications that you are performing with any stakeholders regarding the fixed link. You are operating through Able Connections Ltd, and as such have an obligation to inform your fellow directors of your activities. Thank you. Bob Seely was interviewed by IOW Radio on the 24th Nov 2017. Click on the photo or Here to listen to the MP’s thoughts about the ferries and the campaign for a fixed link. During the interview, Bob Seely claimed that PRO-LINK chair – Carl Feeney, abused the public and IOW Radio Staff. This has never been the case of course. Subsequent to the interview and after a week long investigation by Lucy Morgan (programme manager), she made it clear to Carl Feeney that no IOW Radio staff member had suggested they’d been abused by PRO-LINK or Carl Feeney. Carl was advised by Lucy to ask Mr Seely why he would have made such a defamatory statement? Footnote: On the 12th December 2017, Carl Feeney questioned Bob Seely in person in Westminster at Portcullis House, regarding the matter above. The conversation was a heated exchange, with the MP angry at being questioned. BS conceded that the allegation of abuse could not be corroborated by any named person when pressed. At that stage Mr Seely was presented with the fact that his allegations in the IOW Radio interview were fabrications. Mr Seely was unable to refute that statement. He is certainly free to comment on this further if he wishes. Hi Lucy… hope all is well. Just wondering if there were any more developments regarding the Bob Seely interview last December? If you remember, Bob make a subtle accusation that I’d abused IOW Radio staff somehow. I contacted you after, to enquire why he would have suggested that? After a week or so of investigations, you confirmed that you had no knowledge of any reasons… and I should ask Bob instead. To update you, I did ask him. He couldn’t produce any names or evidence and it did appear to be a fabrication on his part. Has anything transpired since then to your knowledge of why he would have made that accusation Lucy? I have to admit, it did cause a fair amount of anxiety at the time and it would be appreciated if you could confirm there is no contention between myself / PRO-LINK and IOW Radio. It appears as though you’ve overlooked or been too busy to respond to the email below sent on the 20th March? It would be greatly appreciated if you could respond please. As I say, do feel free to call Carl. It just means I’ve missed your mail. We haven’t done Your Questions To…. at all this year I’m afraid. We’re again a person down on the team and I’m waiting for someone to start in June. I’m hoping to resume by July, after a couple of weeks of training up our new team member. I’ll come back to you then, if that’s OK? Hi Lucy. I’m sorry….. I couldn’t quite get the gist of your response. 2: Is there a cordial relationship between myself / PRO-LINK and IOW Radio? Yes /No. Just two one word answers. …ps No nothing further with reagrds to the content of your email. No – contention our end – just simply we haven’t yet resumed the show. It has been confirmed that Mr Seely is also claiming to those who will listen, that Tim Cooper stated at the December 2017 Westminster meeting, that 500,000 houses would need to exist on the island, to make the fixed link viable. This of course, is a complete fabrication once again. Nothing of the sort was discussed. Prior to the meeting however, BS stated on the IOW Radio interview (one minute in), that he believes 500,000 people would need to live on the island before a link could be built. This could cause his confusion perhaps? BS appears unaware however, that nearly two million people exist in Hampshire and on the island. The link will benefit all. Even though the MP clearly disagrees with a campaign for a Fixed Link, we respectfully request that no more potentially discrediting fabrications are manufactured. We ask that honesty and ethics are adhered to… no more BS. Rather than present any logical arguments against the advent of 24hr, fast and immediate, affordable freedom of cross Solent access, It has become obvious that the MPs’ tactic to keep the island isolated and protect his interests in both IOW ferry companies, is to dismantle the PRO-LINK campaign. This conduct does not serve the island and its population well. Copyright © 2018 Pro-Pink. All rights reserved.